5-STEP PROCESS, 1 CONTACT PERSON. SIMPLE PROCESSING AND SPEEDY DELIVERY. 5 STEPS TO YOUR AUSTROVINYL. Select the specifications of your dream record using our Inquiry Form or contact us directly via email. We’ll send you a price estimate as soon as possible via email. Orders may be placed via email. Additionally, we’ll take your order over the phone or offer any advice you need. Once your order has been placed, you’ll receive an order confirmation that you should please initial and return via email. Send us your data (music, print material, etc.) using the upload link. After a successful master cut and etching, we’ll press a sample record. The printing of the label, cover etc. will follow shortly after. You’ll then receive your two sample records per post. Once you have received your samples please send us your approval via email. We will start to produce your order after your approval of the samples. Within 4 weeks, your records will be ready to ship! You’ll receive your invoice in the mail. Delivery of your freshly pressed records will be completed as soon as your payment has been received. Your delivery will be sent via a forwarding agent. You can also pick up your order in person on request. FIND INFORMATION REGARDING CURRENT PROJECTS AND NEWS ON OUR FACEBOOK PAGE. We operate Austria’s first and currently only record press in an adapted, 300-year-old house in Fehring, in southeastern Styria. 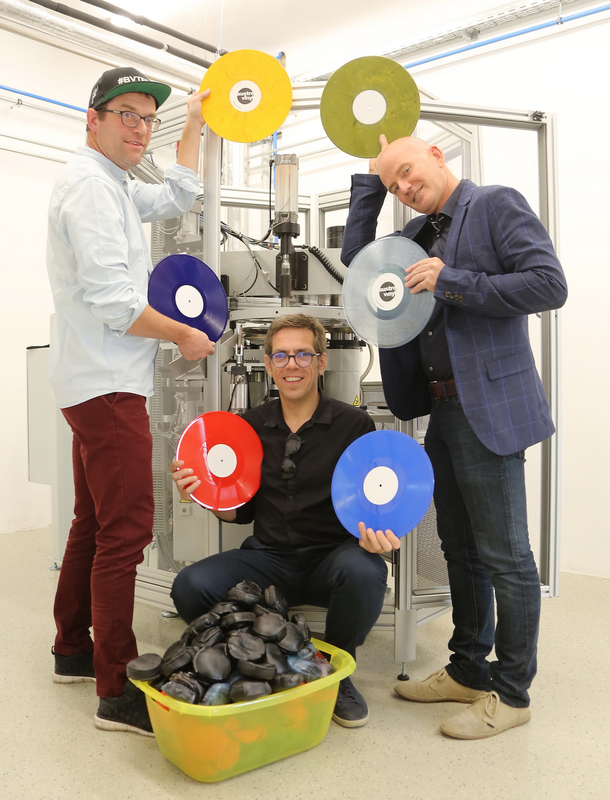 Under the “Austrovinyl” brand name, we offer the complete record production process- from our proprietary mastering studio to production using a new, completely automated vinyl press, to our ready-to-ship parcels. Enjoy the highest quality with the shortest delivery time, at the fairest price and with a completely unique design. In interest of full transparency we do admit that we do not print the labels and covers in-house, but arrange for them to be printed through a partner. CEO Peter Wendler (left) is primarily responsible for the technical operations of the modern facilities. After completing his studies in mechanical engineering and business, he worked for a company that is known worldwide for their work in machine construction. He is also locally-known as a DJ. Johann Fauster (middle), the executive director, is a musician, music teacher and sound engineer. At Austrovinyl he is responsible for the production and the sound quality of the records. Johann Koller (right), is also a musician and the leader of a successful agricultural company. He completes the Austovinyl team with his expertise in marketing and sales. This project, the “New Construction of the Production Facilities” was co-financed by the European Fund for Regional Development. You can find more information regarding the IWB/EFRE here at www.efre.gv.at.